Last year Mitac released the Mio 168 a PDA with GPS hardware, this device was used to created a number of successful navigation bundles. This year Mitac have introduced the 268 and 269 devices which are dedicated WinCE based navigation systems. Priced at £265 including delivery from SuperEtrader.co.uk (at the time of writing) it has a good price point for a complete navigation system with everything you need to get on the road. Our thanks go to Eamonn at SuperEtrader.co.uk for providing us with the review sample. The Mitac Mio 268 is one of the latest additions to the Mitac DigiWalker range of Personal Navigation Devices. The other is the Mio 269. 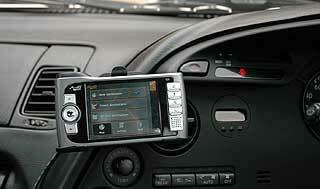 Both are Windows CE 4.2 based systems offering integrated GPS, MP3 Player and Contact management. Powered by an Intel PXA255 processor running at 300MHz with 32Mb ROM and 64Mb RAM. The device also has a 3 and a half inch transreflective TFT touch screen. If this is all too technical don't worry, basically it has the same specification as mid to high range PDAs. This is all packaged in a stylish unit which fits nicely in the palm of your hand. The navigation software on the Mio 268 is called Mio Map and is based on the respected Navigon 4 application, and is complemented with mapping from Tele Atlas. First impressions always count and will set your mind as to the quality of a product. Well my first impressions of the Mio268 were very favorable. The design and construction of the device are impressive. Measuring 5.25" x 3" x 1" it is a perfect compromise between size and useability. With it's even and slim profile it is an ideal size to fit in your pocket when out of the car. The casing is two tone gunmetal and black with silver buttons. It has a quality feel to is and does not appear to be "plasticky" as some devices are. Sited on the right hand edge are the headset socket and also just beneath it (not visible in photo) is a reset switch. On the right hand front are the power indicator, a series of buttons and the speaker. On the top is the SD memory card slot. 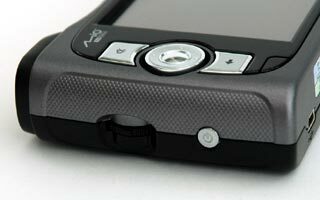 On the left hand edge are a volume control and the power button. At the top on the left (right in this photo) is the GPS antenna. This is the slightly raised bump coloured black. Also seen in this photo is the slot for the SD memory card. 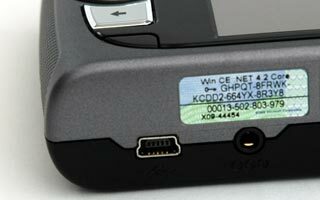 The SD card contains the software and applications for the system. It is also where the MP3 files are stored for listening to music. On the base towards the left are the USB connector and the power connector. You can also see the WinCE license sticker here. 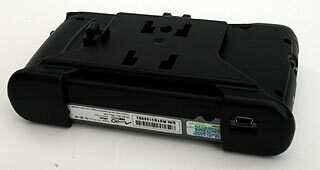 On the back of the Mio268 there is a battery isolator switch (performs a hard reset), an extending stylus, and a socket for the supplied External GPS Antenna. In most normal circumstances you should not need to use the External Antenna, but if you have a car with a coated windscreen, or you experience signal reception problems then this will be required. 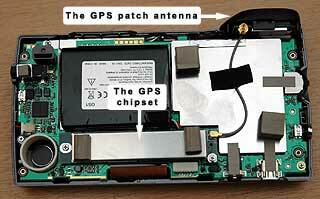 At PocketGPSWorld.com we have this peculiar interest in dissecting things to see how they have been put together. So off with the covers and lets take a look inside. A word of warning. Please don't do this at home as it will invalidate your warranty and may well damage your GPS device. As you can see inside the Mio 268 is dominated by the battery which is rated at 1350milliamps. Not massive capacity, but more than sufficient for an average journey running on batteries. To the top right you can see the GPS Patch antenna. This has been removed as far as possible from all he electrical noise and interference from the rest of the electronics. Towards the bottom of the Mio268 is the GPS Chipset and supporting components. These are heavily shielded to prevent any interference from the other components. Removing the shielding reveals a SiRF GSP2e/LP chipset which is a SiRFstarII chipset.. This seems to be at odds with the current Mio specification (above). Having said that the performance of the GPS is stunning for SiRF II and easily beats any other GPS based on this technology that I have used. Possibly Mio have upgraded the latest 268s to be SiRFIII, or maybe this is a typo. The vehicle mounting system is manufactured by HR in Germany. 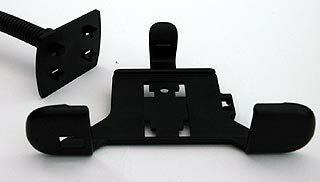 This mounting system is used by a lot of the GPS industry and is very flexible and reliable. It seems strange to rant about something as insignificant as mounts, but if the mount is not right then the whole system can give a bad experience. The HR system uses a male/female four prong connector to mate the device holder to the car mount. A large number of options are available, but the Mio268 is provided with a windscreen suction mount. This is guaranteed to work for all vehicles. I have tested the Mio268 with a number of different mounting systems from Brodit and HR with a great deal of success. If you are interested in different mounting systems then look at our mount reviews in other sections of our site. The Mio268 comes with 3 applications loaded: A contacts manager, an MP3 Player, and of course the Mio Map navigation program. The Mio268 is a Win CE .NET 4.2 device. What's that I hear you ask? Basically it is the operating system, like Windows XP, that provides the common foundation for applications to be built on. The Mio268 is a locked device. By this I mean that although there are many applications for Win CE available you can only use the Mio268 with the supplied ones. When you first start the Mio268 you are presented with a number of screens prompting you for information like time and date, language etc. When the main system starts you are presented with then Menu screen displayed to the right. You can either tap on the screen to select the item or use the 4-way navigation button. The Mio268 does not support ActiveSync as other WinCE devices do but comes with a bespoke application (MioTransfer) to install software and files on the device. This is used to perform a system restore, copy music files, and synchronise contacts. The MP3 files can be copied directly to the Mio268 SD card if you have a card reader on your PC. The maps and contacts need to be installed using the MioTransfer program. The Mio Map CE application is a customised version of the Navigon Mobile Navigator 4 software. It uses Tele Atlas mapping data. I am not certain which release of maps is used, but it would seem to be the first 2004 TeleAtlas release. Obviously people do not consider buying the Mio268 because of the contacts or MP3 player, it is because of it's Navigation capabilities so that is what this review will concentrate on. 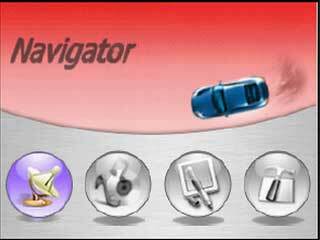 We did a full review of Navigon Mobile Navigator 4 some time ago. Click here for the full review. This review will give you a an idea of the features available in Mio Map, but the other review covers the functionality in more detail. Starting the Mio Map you get a "nag screen" warning you not to use it whilst driving etc. There is no way to disable this little irritation. Once you have past this then you get the destination selection screen. The destination selection screen has 4 navigation buttons and 2 settings buttons. The selection of the address takes a bit of getting used to and is a little fiddly. You can enter postcodes, but only the first 5 characters are used, so you still have to select a road and house number. The selection is performed by typing in the first few letters and then pressing OK this will populate a list for you to select from. All the fields that you need to enter are labeled with the exception of the house number, which is entered after the street name, and is not all that obvious. When you have entered the destination you can then tap the start navigation button and the Mio268 will start calculating a route. Routes cannot be calculated unless there is a satellite fix, as this is the start point for your journey. This does of course mean that you cannot play with the system and plan different routes. The Mio Map software also allows you to select a saved destination, or a recent destination for your journey. Route calculation can be configured in a number of ways to suit your driving style and preferences. In particular you can plan for: slow car, std car, fast car, motorcycle,lorry,bike,pedestrian. You can also select fastest route or shortest route. There are also options for Motorways, Ferries and Toll Roads. All in all a good selection of configuration options. The display has both 2D and 3D map views with the option of having orientated north up, or direction up. The lower left section of the screen shows the next turn details. The bottom of the display shows your current position and the next street you need to turn into. The right hand side of the display houses an information panel with a couple of action buttons. The left pointing arrowhead allows you to quit navigation and return to the select destination display. The top indicator is the GPS strength, which can be red, orange or green depending on the quality of the signal. Tapping the icon will show the GPS Status screen if you have a satellite fix, otherwise it will prompt you to switch the satellite receiver down to save battery power. The GPS screen informs you about your current GPS fix including positional details such as co-ordinates, speed, Satellite time, and the number of satellites used to calculate this position. There is also an indication of the street that you are in. From this screen you can save the position as a favorite. Closing the display returns you to the main navigation view. The images to the right show the controls that are displayed at the when the map is tapped. These controls are displayed for a short time. These control the 2D/3D map selection, the route overview, North up, Centre GPS location, Drag map, and the zoom settings. The auto button applies the changes you selected and returns to driving mode hiding these buttons. What I have describes so far relates to "Standard" user mode. Hidden in the settings there is an "Extended" user mode. Extended user mode allows you to enter itineraries. This allows you to enter a selection of locations, and then navigate to them in sequence. The itinerary list is sequenced by entry order. Mio Map does not optimise the routing for shortest distance. As with all navigation systems today as soon as you make a wrong turn the system detects it and re-calculates to get you back on the right road. The Mio Map software also comes with an extensive manual, but due to the translation into English it is sometimes difficult to understand. You can download a copy from the Mitac Website. The end is in sight. Notice the double turn warnings. The Mio Map CE Day/Night mode. Move your mouse over the image above to see the night mode. This is the GPS Status display. Here we have the POI selection display. 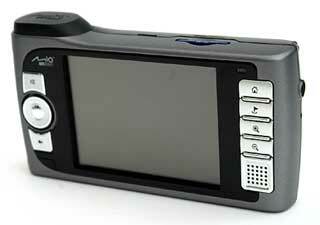 As I mentioned above there are 3 applications on the Mio268 the second of these is an MP3 player. this allows you to play your music on the move. An energy saving feature of the player is to turn off the screen whilst the music is playing thus extending battery life. The MP3 player has the standard features of music players, play lists, equaliser, random play, repeat, intro etc. I think Mitac and a lot of the other companies making these PNDs are missing a trick by restricting the music player to MP3s. My music collection consists of many Gigabytes of WMA files but only a few megabytes of MP3s. It would make more sense to release a dual standard player as most people with a PC will probably use Windows Media player and rip to WMA format. The final application on the Digiwalker is the contacts manager. The Contacts Manager allows you to synchronise the Digiwalker with Outlook and download all your address book details. This not only includes names and phone numbers, but also addresses as well. However another link missing here as you can only view the contacts. They do not interface to the Mio Map application. Maybe in a future release this functionality will become available. I have used the Mio 268 over the last few months in conjunction with a number of other GPS Systems. Overall the Mio268 had good performance, and was reliable, producing similar routes to my other more expensive GPS systems. What did astound me was the sensitivity of the GPS. 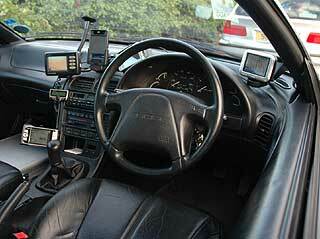 In the PocketGPSWorld car I have the Mio268 positioned partially in the passenger foot well. I have never experienced and reception issues in this location. Even in my office I get a 5 satellite fix, but for me the most amazing fix I got was on a train. I just had the receiver switched on while I was writing this review, when I suddenly noticed that I had a 6 satellite fix, something that even some of the new SiRF III receivers cannot achieve. This was what made us open up the Mio268 to find out what chipset was really in there. As with all navigation systems the routes that are selected are not always the ones that you would select with local knowledge, but the important thing is that you arrive at your destination. All the routes I created seemed reasonable. One of my favorites is to go from Rayleigh in Essex to Glemsford in Suffolk. There is not an easy or obvious route for this journey, and my friend and I always disagree which way is the fastest. The good thing about this journey is that there are a large number of marginal decisions to be made. The Mio268 managed to create a good route which got us to our destination in plenty of time. The navigation instructions are clear and concise. In fact this is the most polite voice navigation system I have seen. With comments like "prepare to turn right" followed by "Please turn tight in 200 yards" finally "Now turn right". The only critism I would have here is that there is not sufficient volume for the instructions to be heard at motorway speeds. This results in having to look at the screen, not an ideal way of navigating on busy roads. My preferred method of mounting depended on which car I was driving. In the Probe I like to use the low mounting position as shown in the top of the 3 pictures. Here you can see the setup for the PocketGPSWorld.com Euro trip in August. an array of 5 navigation systems under review. The lower 2 pictures show my Supra setup. The mount connects to a Brodit HR adapter plate, which is screwed to a tilt/swivel base, and finally all secured to a Brodit ProClip. This setup was the most stable of all I tried. Of course these mounts are extra accessories. 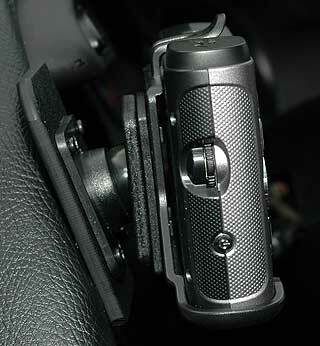 The Mio268 is provided with a windscreen suction mount. When using this I always make sure that the PND is resting on the dashboard for maximum stability. I only had a few problems over the time I reviewed the Mio268. The main one being the currency of the maps. The maps will always be out of date, there is no easy way to overcome that. When the major roads and major changes to these roads are not included in the map release then it becomes awkward to navigate in those areas. Another mapping issue I found was the system reporting turns that are not there. These I suspect are faults in the map data which Mio Map assumes are junctions. As an example: when traveling from Southend on the A127 between Progress Road and the A129 junction. The software continually issues the commands "Prepare to bear left", "Now bear left" in quick succession over a stretch of about a mile. If you are supposed to exit at the A129 you may miss that as the correct "now bear left" is issued very late, following the sequence. This doesn't happen on other systems using the Tele Atlas data. The volume was not loud enough when driving at motorway speeds. There are occasions when the power monitoring system has got "confused" I had 67% battery power left but the indicator was read and warning of a low battery. 90 minutes of driving later I was still using the system, and it still had over 30% power left (according to the settings/power). It wasn't a major problem, I just got worried that it would not last until the end of my journey. I don't like the idea that there is no official way to add WinCE applications to the system. I see the point of controlling the software for use in a controlled environment for the "normal" user, but advanced users might like to use the Mio268 for Topographical navigation using OziExplorer, or for any of the many other WinCE applications out there. There is no facility to add in customisable POI data. This means that you are not able to use the PocketGPSWorld.com Safety Camera Database. Because the system is locked you are not able to make use of the 3rd party POI warning systems either. 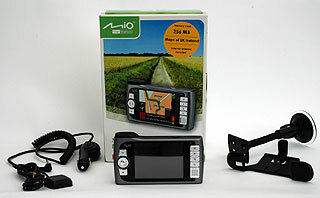 The Mitac Mio268 is a great Personal Navigation device with a price point to rival it's competition. It is slightly lacking in features, but is an ideal first SatNav system. One of the things that most impressed me was the signal reception. 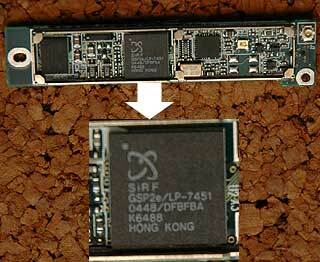 Although I have a SiRFstarII GPS chipset it had excellent performance. I really like the look and feel of the system. It could do with a larger speaker and more volume, but the design and finish is better than I would expect for a product in this price range. On the downside I found the Mio Map CE software a little difficult to get used to initially. It is not the most intuitive software on the market. There needs to be some more thought put into the integration of the system applications.